In a medium bowl, whisk together flour, baking soda, salt, cinnamon and nutmeg. Set aside. In the bowl of a stand mixer, mix eggs on medium speed using paddle attachment until well-whisked, about 30 seconds. Add oil, applesauce and vanilla and mix on medium speed until combined. Add sugars and beat until smooth. Add in the flour mixture in two additions, mixing on low speed between each addition. 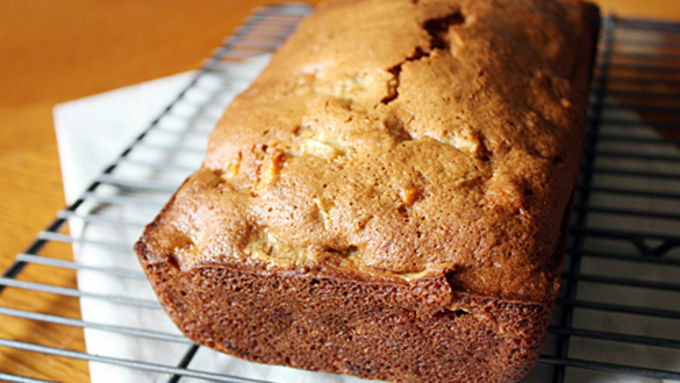 Gently fold in rhubarb and apple and pour into a lightly greased 8 x 4-inch loaf pan. Optional: Top batter with cinnamon/sugar topping. Bake for about 50-55 minutes, or until a toothpick inserted in the center comes out clean. Allow to cool 10 minutes in loaf pan before removing and cooling completely on a wire rack. Did someone say "potluck"? Whether it's at work (where I've become the resident potluck planner), at church, or among friends, it seems everyone wants to have a party centered around food. But what makes a potluck better than any ol’ get-together is that you get to sample a little bit of everyone's culinary creativity. Bonus: No one person is stuck making all the food. Let me tell you, this is fantastic news for a host/hostess. If there's a list going around of what everyone should bring, I almost always try to be the DD -- designated dessert-bringer (OK, I guess that's DDB, but roll with me here). And if not that, I try to bring bread. And it's even better when I can combine the two, like with this Rhubarb Apple Quick Bread, adapted from Two Peas and Their Pod. 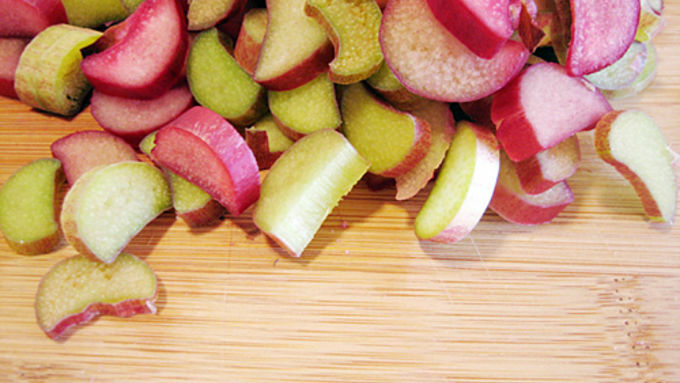 In many places fresh rhubarb is still rampant, and you can find flavorful apples at grocery stores any time of the year. The combination of flavors is so perfect: Sweet and tart, with bright chunks of rhubarb and apple folded into sweet cinnamon and nutmeg. It’s a little bit of summer, a little bit of fall and all delicious. It’s also the perfect thing to make for a potluck, especially when time is short but you don’t want to be “that guy” or girl who brought the store-bought potato salad. 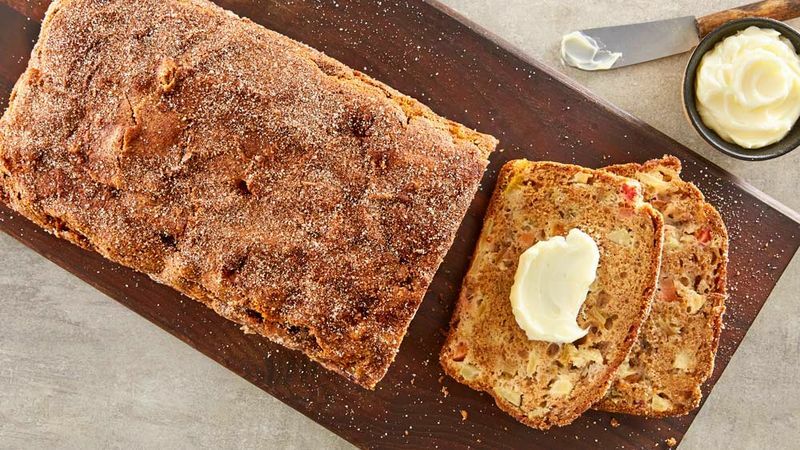 I’ve made this bread both with and without the cinnamon-sugar topping, and it’s tasty either way (though it’s more dessert-like with the crunchy coating on top). It’s also yummy with a dollop of vanilla bean ice cream or homemade whipped cream. And it’s even better when shared in the company of your fellow potluckers. Just be sure to leave room to try what everyone else brought to the table!